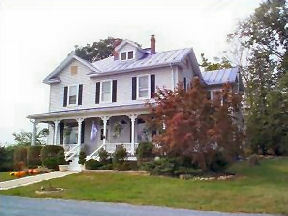 This lovely Luray Bed and Breakfast, is located in a Victorian house on 3 acres with gorgeous view of the Blue Ridge Mountains. Delicious complete breakfast, rates: $110-$150, 10% discount for: 2 or more nights, weekdays, AARP, AAA, Mobil. Pet/child fiendly, Each guest room (5) has its won bathroom, 1 king sized bed, 2 queens, i double, 1 twins. 3 have fireplaces. TV room and parlor, hot tub. The MayneView is located near all attractions of the Shenandoah Valley, just minutes from hiking, fishing, golf,canoeing and skiing. The MayneView is an ideal base for those exploring the area's many tourist attractions, including the world famous Luray Caverns, The New Market Battlefield, as well as numerous antique shops and country auctions. Enjoy the beauty of the Shenandoah sunrise accompanied by our gourmet breakfast. Book one of our Special Packages and let us do the arranging while you sit back, relax and enjoy the view. This and other Blur Ridge Mountain Bed and Breakfast Inns can be found here online in The Register.